SlumberSource offers FREE White Glove InHome Setup on Adjustable Beds & Massage Chairs. What does that mean? In Home Placement including “unpacking” and “light assembly”. Light assembly is defined as 15 minutes with no tools. 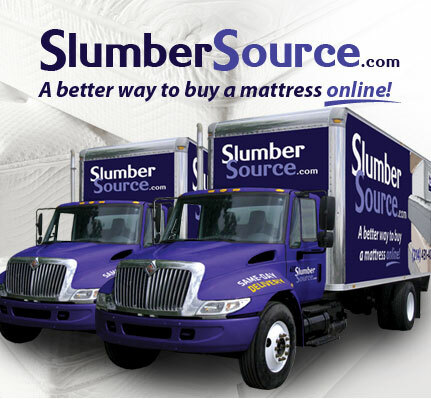 SlumberSource.com will Deliver to your residence in 4 business days. When your merchandise leaves the docks our delivery partners can take up to 5-7 business days to ultimately deliver your merchandise to its final destination. Once the item arrives to your doorstep, our local installers will arrive very soon thereafter to unwrap & setup. Within 99 days after your Mattress purchase, if you are not completely satisfied with the comfort of your new mattress, you may exchange your original purchase (one-time exchange) for another selection. For Mattresses, Simply pay for the return shipping to Texas (will vary depending on your location) and Re-Delivery/exchange Fee of $150 will apply. Mattresses must be returned in original packaging. SlumberSource recommends that you sleep on your mattress for at least 60 days to ensure that the padding settles properly, and your body has the time to adjust to the feel of your new mattress. Stained, damaged, clearance, closeout, "AS IS", and special order products are not covered by the 99 day comfort guarantee. Special Order mattresses such as Twin XL, Split Queen and California King are not eligible for exchange. The manufacturer's law label must remain intact, and sewn into its original position, to qualify for any exchange. We only allow for one comfort exchange, as future exchanges are waived and all sales are final. For Adjustable Beds and Massage Chairs, simply pay the return shipping. Items must be returned in Brand New Condition with original packaging. You can also purchase new packaging by calling customer service. In the Unlikely event merchandise is damaged during transport, SlumberSource.com will replace that item with no questions. Low Price Guarantee & Sales Tax Policy If you can find the identical or comparable (by specs) sleep set for less than our prices displayed on the website, simply call us and we'll beat the price by 5%. No state sales tax is collected for deliveries to any state in the United States (including Texas) where the world headquarters resides. Please call us for further details.